Former CEO of Anglo Irish Bank, David Drumm (51), with an address in Skerries, Co Dublin, pictured at the Dublin Circuit Criminal Court earlier this week. Photo: Collins Courts. IF David Drumm's rise in the world of banking was meteoric, his downfall has been a long, drawn-out affair. The jury verdict on Wednesday, finding him guilty of false accounting and conspiracy to defraud depositors and investors, comes almost a decade after he resigned as chief executive of Anglo Irish Bank as it teetered on the brink of nationalisation. He spent most of the period between these two events living in the US, where he endured a lengthy bankruptcy process and battle against extradition. On Wednesday, he was found guilty of conspiring to defraud and false accounting in a €7.2bn "confidence trick" on the markets during the financial crisis. 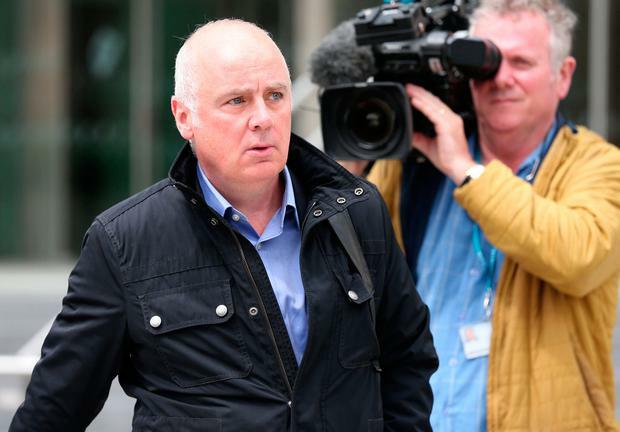 Drumm had pleaded not guilty to conspiring to defraud by dishonestly creating the impression that Anglo's customer deposits were €7.2bn larger than they really were in September 2008. He had also denied false accounting, by providing misleading information to the market on December 3, 2008. But the jury delivered guilty verdicts on both counts - after an 86-day trial at Dublin Circuit Criminal Court. The 51-year-old is a native of the seaside town of Skerries in north Co Dublin. Drumm will be sentenced later this month. He was educated by the Christian Brothers and joined Deloitte and Touche from school, where he trained as a chartered accountant. In 1988 he joined Enterprise Equity, the venture capital arm of the International Fund for Ireland that assisted start-up companies on both sides of the Border. Five years later he made a short-lived move to accountants Bastow Charlton, but quickly jumped at a chance to join Anglo as an assistant manager. The lender was then very much a boutique bank, often catering for borrowers who were refused finance elsewhere. The bank was impressed with what they saw and by 1995 he had been promoted to manager. His big break came in 1997 when he was dispatched to the US to grow Anglo’s operation there. Anglo quickly became a big player in Boston’s real estate market financing major projects, including the $300m (€255m) Mandarin Oriental Hotel. Anglo’s US operation was seen as being exceptionally responsive to customers, gaining a reputation for making decisions quickly. The success marked out Drumm as a potential successor for then chief executive Sean FitzPatrick. He was appointment head of Irish lending in 2002 at the age of 35 and when Mr FitzPatrick announced his retirement two years later, Drumm beat more fancied candidates for the role. Under his leadership, Anglo became synonymous with the financing of property developers. Lending grew and so did profits, but the bank was hopelessly exposed when the global economic crash hit in 2008. It emerged that December that Mr FitzPatrick, by then Anglo’s chairman, had not been disclosing tens of millions of euro in loans he had from the bank. Mr FitzPatrick resigned and Drumm followed him quickly out the door. Drumm and his family moved back to Massachusetts, living for a time in Cape Cod before moving to another home in a suburb of Boston. Trouble soon followed Drumm across the Atlantic. He had borrowed heavily from Anglo to buy shares in the bank. These were now worthless and loans of €8.5m were being called in. He filed for bankruptcy in the US in 2010. In January 2015 a US bankruptcy judge refused to discharge Drumm from his debts, which amounted to around €10.5m. This denied Drumm a fresh financial start. By that stage US authorities were also examining an extradition request for Drumm after the Director of Prosecutions decided he should face charges for a number of offences linked to his tenure at Anglo. While in the US Drumm had been asked to return home to assist a Garda inquiry, but had not done so. That October he was arrested on foot of an extradition warrant and he would spend much of the following five months in a maximum security prison south of Boston as he fought against being repatriated to Ireland. His time there included a period in solitary confinement while prison authorities worked out a safe place to put him. He complained about “uncomfortable” prison conditions while unsuccessfully seeking bail. Eventually he dropped his fight against extradition and was returned to Ireland in March 2016, almost seven years after his departure. After a series of delays he finally went on trial in February of this year. He is due to be sentenced on June 20 next.